We believe in the fundamental importance of great light and great sound. Our technicians illuminate monuments such as the world famous Brandenburg Gate, site of the former Berlin wall, which we staged during the Festival of Lights for some 600 000 guests in 2011. We display your products with the latest lighting, sound and 3D technology on impressive buildings or huge screens, indoor or outdoor. Staging a series of fireworks, you get the ultimate multimedia experience. It’s always a huge hit with the audience to stage Handel´s Music for the Royal Fireworks to magnificent fireworks displays. 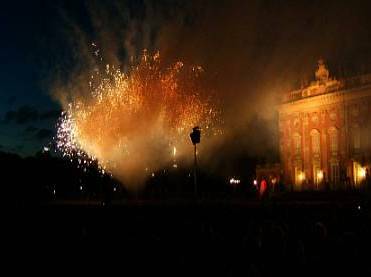 Collaborating with the world famous Semperoper of Dresden, we do open air concerts with a fantastic fireworks finish as the icing on the cake.